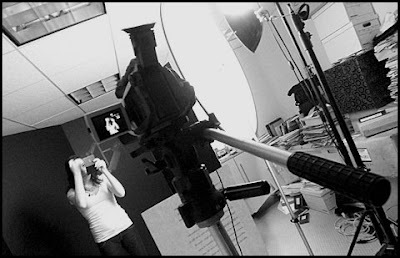 On Friday we shot Episode Two of the Photo Chick project. Note that this is very straightforward, ultra-low-budget production, since that is all that's really needed: borrow an office, move the desks out, set up and shoot. Big soft boxes? Nope -- point some hot lights through a diffuser. Fancy set? Nope -- some black board. Boom mic? Nope, Lavalier Microphone. Crew? Nope: point the camera and tape.